Shut down the Caldera Mine for Garisa Llethri. Talk to Garisa Llethri in his manor in Ald'ruhn for duties. Talk to people around Caldera to learn that if Dahleena were freed, the slaves might revolt. Find a slave key in the guard tower and free Dahleena. Kill Odral Helvi and Stlennius Vibato. Return to Llethri to complete the quest. 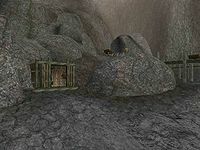 Once you complete the Evidence of Corruption quest for him, Garisa Llethri in his manor in Ald'ruhn will ask you to go and shut down the Caldera Mine for him. Talk to people around Caldera to learn that if Dahleena were freed (or killed), the slaves might revolt, causing the mine to close. Choose either method and report back to Llethri to complete the quest. He will reward you with a pair of ebony boots and a reputation point. An alternative way of closing the mine is to kill the mine operators Odral Helvi and Stlennius Vibato. If you take this route, Llethri tells you that you have caused "political problems" and you will receive only 10 Disposition with him and you will receive neither the ebony boots nor the reputation point. A slave key can be found at the top of the mine's guard tower. Stlennius Vibato carries another one. Do not free Dahleena before receiving this quest. Doing so will cause the quest to start at stage 50, but then the only way to complete the quest and receive all of the rewards is to kill her. This quest can be completed by a non-Redoran if you have the Caldera ebony mine topic, by killing Dahleena and then reporting to Garisa Llethri. 10 Garisa Llethri has asked me to disrupt the ebony mines in Caldera. If I shut the mines down, I will have won Garisa Llethri's support. 30 I was told that if I got rid of Dahleena, nobody could work the mines. 35 I was told that if I killed Odral Helvi and Stlennius Vibato the Caldera Mines would be shut down. 50 I freed Dahleena. Now that she's gone, the mines of Caldera will shut down for at least a few days. 100 Finishes quest Garisa Llethri thanked me for shutting down the ebony mines in Caldera. This page was last modified on 28 March 2014, at 23:46.